"John Hancock articulated the text cleanly with magnificent vaulted lines." "Albert, Charlotte's husband, was sung by the commanding baritone John Hancock. A popular father figure with the Metropolitan Opera and gifted interpreter of contemporary roles, he makes an impressive debut this week with the Boston Lyric Opera. "Charlotte's high minded husband Albert (baritone John Hancock) sang with refined tone and musicianship. He commanded the stage whenever he was part of the action. 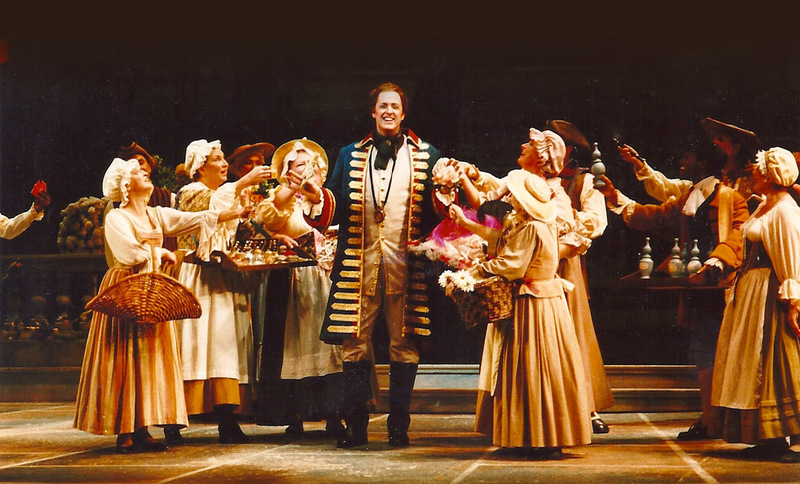 "They all shined when in the presence of the older characters, servant Despina (soprano Emily Pulley) and Don Alfonso (baritone John Hancock) whose acting, stage presence and vocal maturity provided the roux that brought the production together. "John Hancock not only had a towering physical presence, but had a voice to match: a mellifluous, responsive baritone that rang out soundly in the house." "Nearly every member of the cast was a standout singer and performer, especially John Hancock as Mr. Webb (get ready for this tall drink of water! ), Kevin Langan as Dr. Gibbs and Phyllis Pancella as Mrs. Gibbs. “John Hancock was a singular Faustus among thousands. His ability to fill the role defies comprehension. His voice seemed elastic. Sprechgesang, Bel Canto, Dramatic! All this he could do, and how! “John Hancock, a fine baritone who’s performed well in Prokofiev’s The Gambler at the Met, had his Russian more professionally in hand and vocalized strongly as Mark, with detailed point and gesture. “John Hancock projected strength as Mr. Astley. “In their respective roles as Manon’s self-serving brother and her foolishly wealthy betrayed benefactor, baritone John Hancock and bass Eric Halfvarson excel in their roles as Lescaut and Geronte. Again, fantastic voices matched by equally strong acting chops. “John Hancock leant an unusually substantial, attractive sound to Dancaïre. ©2012 John Hancock Baritone. All Rights Reserved.